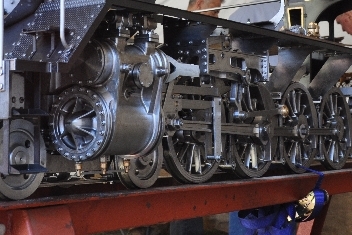 "Let us take you for a ride"
At the Pietermaritzburg Model Engineering Society our primary objective is to foster an interest in engineering by building miniature replicas of locomotives, stationary engines, internal combustion engines, hot air engines, machine tools, and any other engineering related projects to the original working specifications. There is a great emphasis on steam preservation. 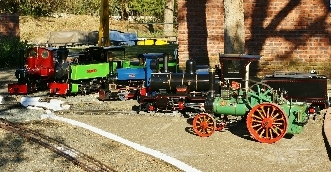 We have a running day every first Sunday of the month when members of the public can buy tickets to enjoy a ride around the miniature railway circuit, hauled by steam and 'diesel' locomotives. 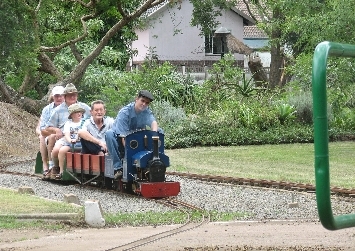 Visitors are encouraged to make use of our beautiful park and braais for picnics. On the first weekend of August each year we host our Wings, Wheels, and Whistles hobbies exhibition, this is the only time that we charge a small entrance fee. 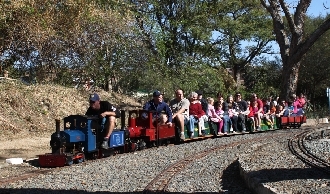 In addition we run children's birthday parties every Saturday and sometimes during the week when a miniature train pulled by a diesel locomotive provides rides for all. All you need to supply are table cloths and the eats! The grounds are large, well-kept, and secure, allowing the children the opportunity to play outdoor games, with plenty of parking. The grounds and all facilities are reserved for the sole use of whoever has booked them. The party would typically run for two hours in the morning or afternoon, 10h00 to 12h00 or 14h00 to 16h00. The gates will be opened half an hour before the appointed time, and will be closed half an hour after the party. Any numbers of children in excess of thirty will attract an additional charge.